I love to sew. I’m also a bit of a Victorian nut. 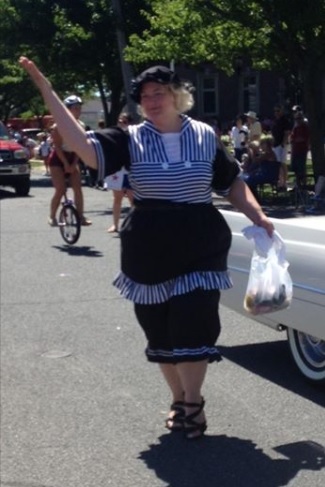 So when my friends at the Historical Society of Ocean Grove asked for costumed volunteers to walk in the town’s July 4th parade, my hand shot up faster than an illegal roman candle in an empty lot behind a trailer park. Thing was, though, I didn’t have much time. I’d have to find a shortcut. I looked online for ready-made costumes, but all the halfway decent ones didn’t come in my size. Even the plus size costumes stopped at 3X. I’d need a little more room for my hips. That’s when a friend pointed me towards the mouth-watering vintage-style plus size dresses from ModCloth. They offer clothes in sizes all the way up to 4X. How did I not know about this company before? Yes. This was the answer! I would deconstruct a sundress with a vaguely 1890s neckline and cut my sewing time in half! Thank you, ModCloth, for selling such delightful clothing, and in sizes that FIT ME. And as much as I love to sew, you offer so many of the things I’d make anyway if I had more time. So now, because of you, strutting my stuff with vintage panache is more readily possible than ever. ← Did You Do the Read My Hips “Strutting Experiment” Too?